Published: Aug. 24, 2015 at 05:07 p.m. Updated: Aug. 24, 2015 at 05:21 p.m.
We have reached the halfway point of the preseason schedule and things are starting to come into focus. The good news is that some players have exhibited standout performances on the field. The bad news is that injuries could be opening up opportunities that might not have otherwise existed. As such, there has been some movement in the fantasy stock across the NFL. This is one of those unfortunate situations where an injury to a top player is creating movement for someone else. With Jordy Nelson suffering a knee injury in the preseason, more attention will turn to the second-year player from Fresno State. 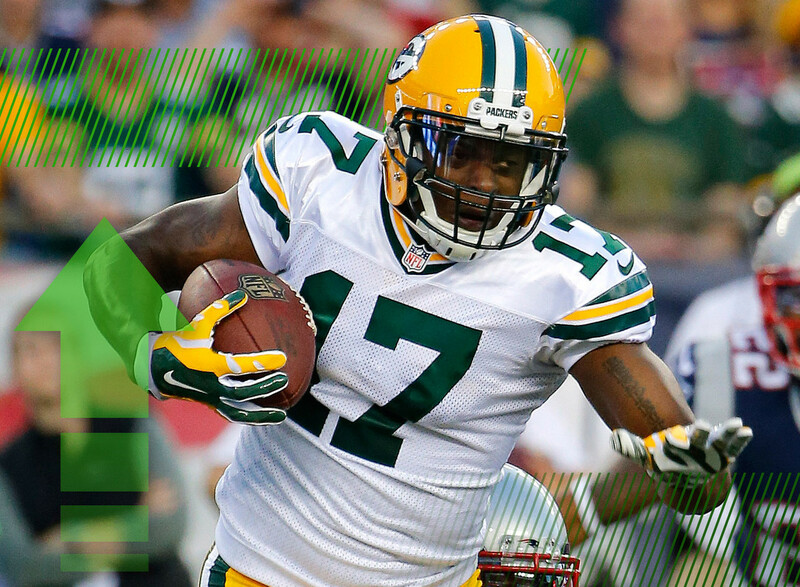 Adams was earning praise from Aaron Rodgers during training camp, but was still solidly behind Nelson and Randall Cobb on the depth chart. Now it looks like Adams could see more targets than originally anticipated. The hits just kept on coming for Griffin in Preseason Week 2. So much so that Griffin left Washington's game with multiple injuries -- including a concussion. But even beyond Griffin's health, his play has been subpar, leaving some to wonder if (or when) Kirk Cousins could take over as the team's starting quarterback. This year's crop of rookie quarterbacks isn't expected to make a big fantasy impact in 2015, but Mariota is certainly doing his part to open some eyes. After a rough start, the former Oregon star rebounded to finish strong in his preseason debut. He doubled down with an impressive showing in last weekend's game against the St. Louis Rams. There is still reason to be cautious about what the Titans offense can truly offer, but Mariota could return some long-term value in keeper and dynasty leagues. Funchess finds himself in a situation similar to Davante Adams. With Kelvin Benjamin lost for the season with a knee injury, Funchess could assume a much larger role in the Panthers passing game than was expected. If you decide to take a chance on the Michigan product, keep in mind that he's expected to be a work-in-progress this season. He could see a fair number of targets, but you could be disappointed if you're expecting him to duplicate Benjamin's numbers from last season. Randle suffering an oblique injury last week -- albeit minor -- was a reminder that Randle has earned much of his hype through a very small body of work (just 51 carries last season) and that we still have no idea how he can handle a large workload. Just as important have been the constant reminders that the Cowboys backfield will likely be a committee situation with Darren McFadden. Some coaches' preseason statements are smoke screens. This doesn't feel like one of them. Maybe this is less of a downgrade and more of a course correction for the rookie from Wisconsin. Gordon was held out of the preseason game against Arizona as a precaution after suffering a minor ankle injury in practice. The week before that, Danny Woodhead and Branden Oliver each played a role in the Chargers running game, which could be foreshadowing for how San Diego plans to rotate all three backs during the regular season. Gordon should have plenty of value, but we should slow down on the talk about him being a major workhorse. Speaking of course corrections, Murray's value had been sinking, but a nice preseason performance against the Vikings should do a lot to give it some buoyancy. There is concern that Murray won't be a three-down back with Roy Helu hanging around on the roster. While it's a valid worry, it shouldn't be enough to completely discount Murray's fantasy worth as a potential RB2 in most formats. When the Cardinals signed the veteran free agent, there was talk that it spelled doom for Andre Ellington's status as the team's workhorse. That could still be the case, but it looks like it might be a different Johnson who gets to eat. While the former CJ2K is set to miss time with a hamstring injury, rookie David Johnson looked strong in last weekend's game against the Chargers. There's still no strong indication that the Cardinals won't go with one primary running back, but if there's an understudy, it appears to be the younger of the two Johnsons. Lots of eyes were on the Texans quarterback battle between Hoyer and Ryan Mallett -- a battle that ended when head coach Bill O'Brien awarded the gig to Hoyer. Neither option in Houston was particularly enticing to fantasy managers, but a starter will always have more value than a backup. However, this also gives us something to watch for the rest of the preseason as we can now note the rapport between Hoyer and his pass-catchers. White's days as a No. 1 receiver -- both on the field and in fantasy -- are likely over. But he had been a nice late-round pickup for fantasy enthusiasts who find comfort in familiar names. That comfort level is likely to drop upon the news that White is expected to undergo elbow surgery. The Falcons expect to have him back in time for the regular season opener, but for a player who is entering his age-34 season and beginning his 11th NFL campaign, it's hardly encouraging.